Vankor is one of the biggest developed Russian oilfields and is scheduled to reach the rated capacity output of 25 million tons annually in the next couple of years. Russian oil giant Rosneft has offered a 10 percent stake in the Vankor cluster oil fields to ONGC Videsh Ltd (OVL), the overseas arms of India’s oil and gas bellwether, PTI said, citing sources. The offer follows a similar offer made to CNPC a month ago. The price offered to CNPC is believed to be $1 billion and OVL would be looking at a similar sum. Sources told PTI that ONGC is doing due diligence on the proposal and will make an offer post that. ONGC was not immediately available for official comment. The news agency added that Rosneft in August sent a formal proposal to OVL for the joint development of Yurubcheno-Tokhomskoye oilfield in eastern Siberia. The Vankor deposit, located in the north of the Krasnoyarsk Territory in central Siberia, was launched back in 1988; at the start of 2014 the initial recoverable reserves of oil totaled 500 million tons of oil and condensate and 182 billion cubic meters of gas. “It should be taken into account that the Vankor cluster is not a new, undeveloped or complex project. The deposit already has the entire infrastructure, including the Purpe pipeline,” Irina Grinets told RIR last month. She added that the exploration on the site started in 2009 and some 21.4 million tons of oil were produced in 2013. In the next couple of years the field is scheduled to reach the rated capacity output of 25 million tons annually. 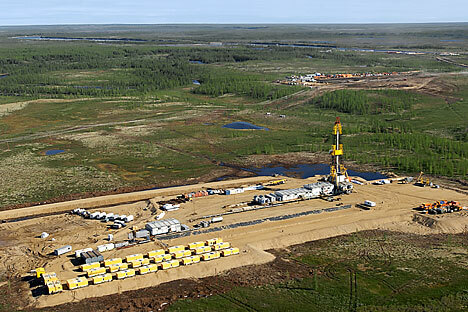 OVL has a 20 percent stake in the Sakhalin-1 oil and gas project in the Russian Far East. There have long been Russian media reports that ExxonMobil, the project operator may be forced to divest a part of its 40 percent stake or even leave the project altogether, on account of U.S. sanctions on Russia. The American oil major has denied the reports, saying it has no plans to exit the project. However, its all-along falling oil production has seriously impacted India’s efforts to reduce its dependence on the imports of oil and gas, which OVL claimed as its main objective of the Imperial acquisition. India’s energy demand is expected to more than double by 2035, from about 700 million tonnes of oil at present to around 1.5 billion tonnes.